The Doona IsoFix Base Car Seat can be installed in your car using ISOFIX anchor points, for that perfect fitting that eliminates the need for seat belts to keep it in place. This ISOFIX baby seat base features an adjustable foot beam too. The seat base is designed for rear facing use only and is compatible with the Doona Infant Car Seat. Earn 658 AgapeDollars for purchasing this product. The Doona IsoFix Base Car Seat can be installed in your car using ISOFIX anchor points, for that perfect fitting that eliminates the need for seat belts to keep it in place. Installing or ejecting the baby seat is very easy with this Doona IsoFix car seat base; all you have to do is click it into position and unclip from the base to lift the seat from the vehicle. The accessory is compliant with the EU regulations. This ISOFIX baby seat base features an adjustable foot beam too. The seat base is designed for rear facing use only and is compatible with the Doona Infant Car Seat. It is ideal for infants from birth to 13kg. This ISOFIX child seat base features a "normally open" mechanism that locks only when the carrier is put on top of the base. It also features a prominent support leg color indicator that avoids misuse. The accessory is available in a neat black color and weighs in at 7.2kg. This baby seat base ensures a safe and perfect fitting as it can be installed using ISOFIX anchor points. Now there is no need to use the seat belt to keep the seat in place. 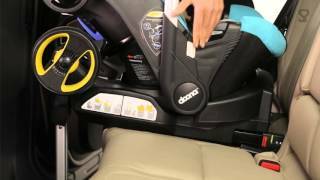 The Doona DN SP102 20 001 IsoFix Base Car Seat makes it very easy for you to fit the baby seat. The accessory is very safe to use as it is compliant with EU regulations.